If you are looking for some good moral stories for your little one, then you are in the right place! Read on. This is one of the most amazing short story on birds with moral to read along with your kids. A long time ago, there lived a very kind-hearted king. He was very fond of birds and had a huge bird sanctuary in his kingdom. He had never harmed any bird or animal, he hated those who did and he didn’t kill them even for meat. Also, read Bird And The Banyan Tree. In appreciation of his generosity and kindness towards birds, a businessman gifted two beautiful falcons to the king. Now, these two falcons were used to completely different weather conditions. The king thanked the businessman and ordered the head bird trainer to provide all the facilities to those beautiful falcons and make them feel comfortable in their country. The head trainer took care of the birds. Gradually, the birds got adapted to the country’s climate. Also, read The Wise Old Bird. The king was quite surprised and rewarded the bird trainer with a handful of gold coins. He enquired about the other falcon. The bird trainer stated with regret that the other falcon had not moved even a step from day one and had just sat on the branch. The trainer also added that he had tried everything he could but still failed to make the bird move. 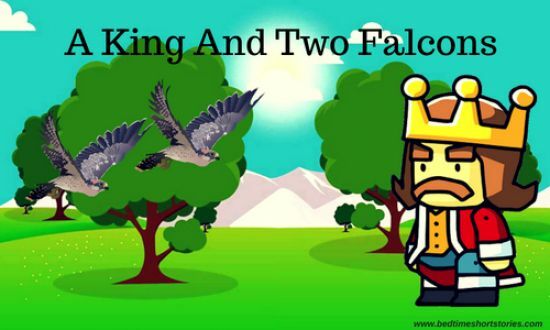 The king consoled him and told him that he would bring someone more experienced than him to try to train the other falcon. Also, read Princess Rose And The Golden Bird. Soon, the king announced that he needed someone to make the falcon move and fly. Hearing this announcement, an old man reached the King’s palace and assured him that he would make the bird fly like the other one. The king asked the head trainer to take the old man to the sanctuary to train the falcon. He said that he would visit them the next day to see if there was any change. Also, read The Story Of A Blue Bird. Many of us are like this. We have wings to fly; we know how to fly, and where to fly. Still, we sit doing nothing or doing something that makes us inferior to others. Also, read A Bird In Hand. DON’T JUST SIT STILL WHEN YOU HAVE WINGS TO FLY.